On Aug. 30, the National Transportation Safety Board issued its final report on the fatal pipeline explosion in San Bruno, CA, that occurred on Sept. 9, 2010. The report named Pacific Gas & Electric's "lax approach to pipeline safety" and the failure of overseeing bodies to check that approach as the main factors in a preventable accident. United Rentals Inc. announced its new partnership as an official sponsor of the National Hispanic Construction Association (NHCA). United Rentals will support the NHCA in its mission to provide educational, professional and technical resources to members of state and regional Hispanic contractor associations. Case Construction Equipment has announced its plans to transition D3 Equipment’s operations in Southern California over to Case Power & Equipment stores. The 7th Annual Western Regional No-Dig Conference & Exhibition to be held Oct. 3-4, at the Wyndham Hotel in San Jose, CA. Tennessee Governor Bill Haslam and Department of Environment and Conservation Commissioner Bob Martineau announced recently that seven communities and one county have been approved to receive low-interest loans for water and wastewater infrastructure improvements. The Occupational Safety and Health Administration recently unveiled a new interactive web tool to help users determine whether injuries and illnesses are work-related and recordable under the OSHA Recordkeeping rules. Less than a year ago, the Association of Equipment Manufacturers (AEM) launched <em>I Make America</em>, a national grassroots campaign to increase jobs for America's equipment manufacturers. The message of <em>I Make America</em> is simple: the goal is to create a new manufacturing policy that creates jobs by rebuilding and modernizing America's infrastructure, and by helping farmers and manufacturers sell their products to new markets around the world. Energy Transfer Partners and Regency Energy Partners will spend $700 million in a joint venture to build a 530-mile pipeline to carry natural gas liquids from Winkler County in West Texas to a processing plant in Jackson County, east of Victoria. Alliance Pipeline L.P. has announced plans to develop a pipeline and associated facilities in North Dakota to transport liquids-rich natural gas. The city of Dearborn, MI, held a public meeting in June to propose sewer separation work to stop wastewater discharges in the Rouge River during heavy rains or spring thaw. On Capitol Hill, the House Energy and Commerce Committee debated whether to accelerate a decision by the Obama administration on the Keystone XL Pipeline and the plan to send oil from western Canada to the Texas Gulf Coast. The Northeast Trenchless Association Inc. (NTA) is hosting an Owners and Engineers Outreach Program at the Windjammer Conference Center in South Burlington, VT, on Sept. 23. In an effort to clean up Lake Erie that began with the passage of the Clean Water Act in 1972, U.S. District Court Judge Donald C. Nugent has approved a 25-year regional sewer district plan to reduce the amount of untreated waste that is dumped into local waterways, usually during flooding. Keeping up to date with the latest technology and construction techniques to boost productivity is more important than ever in today’s marketplace. Efforts to block the designation of styrene as a possible cancer-causing agent are proceeding on several fronts while organizations who use styrene in the manufacture of their products consider short- and long-term effects should they ultimately be forced to find a substitute for styrene. Theodore Roosevelt aptly said, “When you are asked if you can do a job, tell 'em, 'Certainly I can!' Then get busy and find out how to do it.” This is certainly the philosophy taken by contractor Tri-City Groundbreakers when they were low bidder on a deep excavation project that was larger and deeper than anything that they had attempted before. Pipe bursting is a proven method for replacing underground pipelines that provide critical services including municipal water, sewer, gas, storm water, electrical, telecommunications systems and more to people throughout North America and the world. A California blue ribbon panel's report blaming a 2008 sewer pipe bursting project for the natural-gas pipeline explosion that killed eight people in San Bruno, CA, was poorly researched, unsubstantiated and ignored more likely explanations, according to city of San Bruno officials. Stabilization of soil to ensure the ground will support foundations and the weight of buildings, highways, bridges and other improvements is a critical element in construction projects. <strong>Proposed 4G satellite service raises GPS Interference questions</strong> A critical report from a Federal Communications Commission advisory committee on June 30 was the latest hitch in the plans of a company called LightSquared to offer new 4G wireless service to broadband users. The pipe winding machine used in spiral wound pipe operates in a unique fashion, allowing it to turn corners, navigate bends and adapt to irregular pipe shapes. <a href="https://oildom.webex.com/oildom/lsr.php?AT=pb&SP=EC&rID=4168057&rKey=1a82d4c401159b02">Watch the webinar</a>. 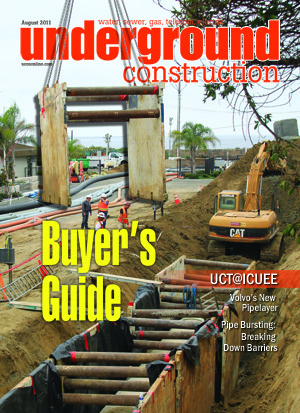 Advertisers from the print edition of <em>Underground Construction</em>, August 2011, Vol. 66 No. 8. John Mele, area manager-North Atlantic Region for HOBAS Pipe USA, has been awarded the 2011 Harry P. Croft Award. This award is presented annually to a member of the New Jersey Water Environment Association (NJWEA) for distinguished and outstanding service to the Association or the field of water pollution control. Pure Technologies Ltd. has completed the purchase of the business and assets of Electromechanical Technologies Inc. (EMTEK), a Salt Lake City-based developer of advanced pipeline inspection technologies. Joseph A. Cunningham, 91, died on May 3, following complications from a fall in Oct. 2010. Caterpillar Inc. announced plans to increase its manufacturing capabilities and capacity for hydraulic excavators that will be produced at a facility now under construction in Victoria, TX. Extreme economic hardships for many municipalities are pushing some cities to consider extreme actions – such as the rarely occurring municipal bankruptcy. Consider the case of Birmingham/Jefferson County, AL. Hunting Trenchless has released its new 700 and 1000 Series HIWS1 drill pipe; a durable, one-piece forged pipe design engineered for the unique rigors of horizontal directional drilling applications. New EDGE Breaker attachments are for use on skid steer loaders and compact excavators. The Spar is a handheld, one-pass, remote sensor capable of locating and GIS mapping in 3-D subsurface cable, conduit and pipe with up to centimeter-level accuracy to depths of one meter (11 feet), decimeter-level accuracy to depths of three meters and sub-meter accuracy to depths of 15 meters (50 feet). Copperhead Industries introduces the first tracer wire made specifically for pipe bursting applications. Condux International offers the complete line of Triple D HDD and compaction boring tools and equipment, including backreamers. Weiler Corporation’s 4 1/2-inch Roughneck weld cleaning brush is designed specifically for use on 4 1/2-inch mini-grinders. The Kenco PIPE LIFT moves pipe easily and cost effectively. Use a lifting sling such as the Kenco RigMAX attached to any type or model of machine with lifting capabilities for easy operation. A new heavy-duty plastic reel for shipment of primary underground cable is now available. As an alternative shoring solution to sheet and shore tunnel access shafts for auger boring, microtunneling, pipe jacking and pipe ramming projects, trenchless contractors can now use the newly designed Transformer Slide Rail System. Rock Shield is a new protective diamond mesh, manufactured from polyethylene that is ideal for protecting your pipeline coating from damaging rock backfills or any projects where pipelines are constructed through rocky terrains.